This is a newly renovated one bedroom guest suite on the main floor of our home it is completely private with it's own entrance off the vestibule. The unit is light filled and spacious. There is a bedroom, kitchenette, three piece bath and a living room. The unit is located directly across the street from a neighbourhood park. We are in the west end with all of the coolest restaurants, great shopping and night life nearby. We are a short walk from lake Ontario and Toronto harbour. I am a self employed artist.I live and work on the premises. I know the city well and I am always happy to share the best things to see and do. Whether you want awesome Persian food or an indie theatre production I can usually point you in the right direction. King west is the most exciting part of the city and Queen west is great for shopping and people watching. We are nestled between these two happening areas. The neighbourhood is so close to everything you can walk almost everywhere and if you want to travel further afield we have two streetcar lines that are just down the street and they run 24 hours a day. The property was clean and the owner accommodating. We enjoyed our stay. The owner was accommodating. The suite was clean suited our needs, and close to everything we were there to do. We would certainly stay here again! Thanks Alan! The Walnut Suite was really great - it had everything we needed and the location can't be beat - so convenient! Our host Alan was really helpful and provided tons of wonderful resources. Thanks! A cute, quiet spot on the park, convenient to everything. If you're not familiar with Toronto, this is a great spot to launch your exploration. It's in a little neighborhood tucked away down a side road next to a park. Location is easy because it is a block from TTC public transportation in either direction. We took the streetcar into the thick of the city every day. Easy, comfortable, and the TTC app helps. The accommodations were as-described. The fridge is different than the one pictured at the time, but it's functional and maybe a bit bigger? In any case, more than we needed. The setup is efficient and the space didn't feel small to the two of us. The living area is nice and the kitchen only lacks a stovetop - which, again, why would you need that when you're so close to all the great restaurants? Bathroom is chic with tiled shower with glass enclosure. Easy entry and exit, thorough thoughtful instructions and suggestions, and an attentive host. Very reasonably priced as well. Would absolutely stay here again. Had a wonderful stay! Very cozy in a chilly time of year. We really enjoyed our stay at Walnut Suite! The appartment is spacious and had everything we needed. 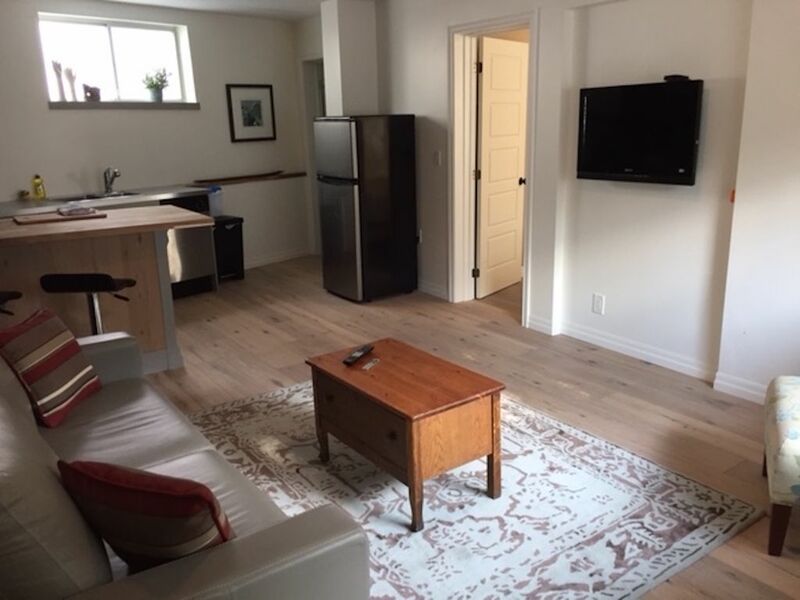 The location right next to Stanley Park, near Queen and King West was very nice and convenient: severaly shops, cafés, restaurants, bars, and Downtown Toronto are all in walking distance. The hosts were really kind, provided us with a lot of useful information, and made us feel very welcome in Toronto and their appartment.